Fine art machine embroiderer and textile artist Cheryl Bridgart has turned her talented hand to painting following a mishap with her ankle which forced her to abandon the sewing machine. Renowned for her delicate embroideries of portraits and surrealist dream-inspired works, she has been painting vibrant contemporary characters on canvas and will present her collection at this year’s SALA Festival opening on Friday July 29. In January this year, gloom pervaded beautiful Beltana House in Carrington St Adelaide where Cheryl lives and works and which is also an exhibition space. “I injured my ankle at the beginning of this year – I ripped the tendons in my ankle and split the tibular and fibular,’’ she recalls. So she began to paint figures on canvas, adding tiny understitched embroidered masks to cover one eye of her subjects. A retrospective of Cheryl’s embroidered and painted art will be exhibited in the Adelaide Town Hall upstairs gallery from Thursday August 5 as part of SALA Festival. “My work has always been dream themes which are related to music, and fun and happiness,’’ she said. Her works will also be on show at the Innovation Science Gallery in Gays Arcade off Adelaide Arcade. The vast space of Beltana House, with its lofty ancient exposed beam roofline, reveals a congregation of painted faces of both men and women, wearing flamboyant hats, colourful clothes –anda those embroidered masks added yet another dimension of flair. Her home was once Pikes Brewery’s city stables and much of the renovation was carried out by society couple Lynette and Anton Schmidt. Each room once housed Clydesdales from Pikes or later, the Police Greys are now converted rooms off the big central space, which was once the carriageway. Cheryl’s rise to professional status began when she entered a national art competition for tourism in 1996 and titled it Billy Tin’’ and won. “I went to England on the prize money and in 2000 I left my job teaching children art at St Andrews School,’’ she says. 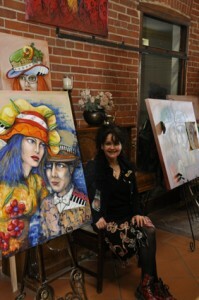 She attended the North Adelaide Art School, but is self-taught in her embroidery and clothing art. “I began sewing as a very small child. I would visit my grandmother before I strted school. She had the big Women’s Weekly magazines and I would go through them and cut out pictures. Then I would design clothes for my dolls from the Women’s Weekly. “I would work on my child’s hand cranked sewing machine. “My first day at Kindy I drew everyone in the class a horse. So, it has always been playing with fabrics, drawing and making clothes. Cheryl has exhibited and taught extensively in Australia and overseas. She is the winner of the Australian Council, Qantas and Tourism Australia “Dreamtime Art Competition’’. Cheryl Bridgartwill hold a “”meet and greet’’ opening of her exhibition at the Adelaide Town Hall on August 5 from Noon – 2pm until August 22.